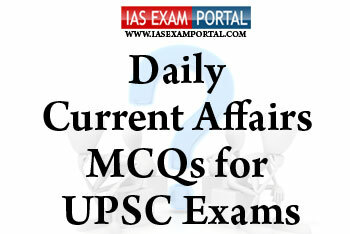 Current Affairs MCQ for UPSC Exams - 22 JANUARY 2019 | IAS EXAM PORTAL - India's Largest Community for UPSC Exam Aspirants. Q1. Which of the following statements regarding the draft Emigration bill 2019 released by the government are true ? 1) The new Bill would ensure the overall welfare and protection of emigrants and it included a proposal to constitute Emigration Management Authority (EMA). 2) One of the proposals is to make mandatory the registration of all categories of Indian nationals proceeding for overseas employment as well as students pursuing higher studies abroad. 3) It also takes into account the increasing incidents of human trafficking, illegal recruitment, illicit trafficking of drugs, harbouring offenders under the garb of recruitment and those offering emigration services without due process. 1) Although India has not signed the 1951 Convention on Refugees and nor it’s Protocol but UNHCRhas been allowed to work in India since 1981. 2) India does not have a legal framework and national refugee status determination system. As a result, UNHCR processes claims for refugee status in India. 3) Official policy of the Indian government is that all refugees, whether those it protects or those under UNHCR mandate, are allowed permanent refuge in India except those from enemy countries. 1) Indian economy at a growth of 7.3% GDP has obtained the highest growth since the last 5 years. 2) The current average rate of inflation at 4.3 % is the lowest since the economic liberalisation of 1991. 3) India has moved up around 65 places in the World bank ease of doing business report (EODB) since the last 5 years. Q5. The term ‘Sedition’ means “conduct or speech which results in mutiny against the authority of the state”. Law of Sedition deals with section 124A of IPC, 1860, is considered as a reasonable restriction on freedom of speech. The law was introduced by which of the following governor generals of British India ?